Compelled to learn about his shadowed past and the family he never knew, Braden is drawn to the city of Belle Dam, where he is soon caught between two feuding witch dynasties. Sworn rivals Catherine Lansing and Jason Thorpe will use anything – lies, manipulation, illusion, and even murder – to seize control of Braden’s powers. To stop an ancient evil from destroying the town, Braden must master his gift, even through the shocking discovery that Jason is his father. While his feelings for an enigmatic boy named Trey grow deeper, Braden realizes a terrible truth: Trey is Catherine Lansing’s son… and Braden may be destined to kill him. From the intriguing opening to the final showdown, this book was a thrilling ride with a guessing game that kept me sorting through the possibilities to figure out what was happening. Braden’s gift is unique – unless he wears heavily tinted sunglasses to focus his attention, he sees through all the layers of the world around him, resulting in sensory overload, nosebleed, and heavy migraines. The perks? He can work out and unravel any spell, unveil the memories attached to a place, widen his gaze to encompass whole cities and even see the dominant forces that make up the character of a person. Basically, there are few limitations to what he could do and the full scope of his gift is unknown as of yet. For Jason Thorpe and Catherine Lansing, the two most powerful witches in the town of Belle Dam and sworn enemies, he is the perfect weapon to tip the scales in their conflict. As soon as Braden arrives in town, still clueless about the feud he has just stumbled into, everyone he meets keeps their own secrets and everyone has an agenda. While Braden struggles with the revelation that Jason Thorpe is his father and that his best friend Jade and his love interest, Trey, have turned out to be Catherine Lansing’s children, he also discovers that there is something foul going on in Belle Dam that no one else seems to be fully aware of. 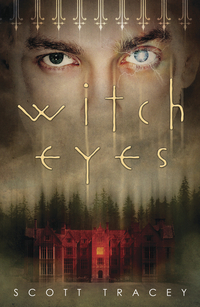 Witch Eyes was a thrill-ride of plot twists and unique magic combined with the coming-of-age story of a boy who still has to master his powers and grow comfortable in his skin. Belle Dam is Braden’s first experience of highschool (he was homeschooled by his uncle in a remote area) and I enjoyed seeing him try to keep up with his normal life while trying to retain his independence as both his father and his new friends and their mother, Catherine, try to get him on their side of the feud. Does he tell his maybe-boyfriend the truth about his father and risk losing him? Or does he continue the lie and risk being exposed anyway? Also, there is an ancestor of the Lansings who apparently had the same gift Braden does. Just what did she do to the town, and what does Lucien Fallon, Thorpe’s lawyer, have to do with all the goings-on? In a town where everyone is picking sides, can Braden pursue his own goals or has he been someone’s pawn all along? If you’re looking for a paranormal read that is different and has an edge, as well as great writing and well-drawn characters driven by a plot full of intrigues, Witch Eyes should definitely go on your shelf! I can’t wait to see what the future has in store for Trey and Braden in the sequel, Demon Eyes, which will be released on October 8. About half a year ago, everyone was raving about this book. Sometimes that makes me a bit wary – what if I don’t like it even though everyone else does? But the prospect of what appeared to be unique story combined with the chance to read a gay protagonist (this kind of diversity is still WAY too rare in YA. There might be a gay minor character but rarely a main one) convinced me that I had to read this novel. Braden’s voice was very authentic and I liked that he was confident and proactive despite being thrown in the middle of a conflict without much information to go on and not sure who he could trust. The question which characters know how much, who is lying and who is simply deceived themselves always hovers over the book. In Belle Dam, no one does anything without a reason. I loved how the magic worked in this book! Especially the concept of weaving it into the geometry and architecture of a place, but also the more traditional elements of summoning circles, drawing energy from nature and using focusing objects. I’m still not quite sure that we as readers know everything about Grace Lansing and what exactly she did at the end of the book. What exactly is the relation between her and Lucien? I think there are still pieces missing when it comes to her history and their bargain. I’m also curious about the hints at the greater supernatural world ‘out there’ that we’ve gotten so far. There are not just witches but also demons, vampires, and shifters, and I’m curious to know more about those. Then of course, there’s Trey and Braden. Though Trey went on my nerves sometimes with how set he was on ‘protecting’ Braden and how blind when it came to his own mother, I’m still hoping the best for him and Braden. I liked the way their romance was handled. It was present and woven throughout the story, but it didn’t consume everything else that was going on and become the main focus. I’d really like to know more about Trey to understand him better, and I also think that both he and Jade will turn out to have some kind of power. I don’t know, it just doesn’t seem likely that they would inherit none of their mother’s gift.